Farming is a tough job. 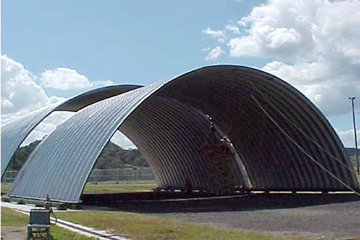 It takes a tough attitude and tough equipment -- like our rugged Q Model Arch Steel Building. When it comes to protecting machinery, equipment, hay, grain, and livestock, this reliable Steel Metal Building is right at home on the farm. The Do-it-Yourself Q Model Arch Steel Building is affordable & has 100% usable clearspan interiors that have no beams or trusses to get in your way. Our solid-steel construction eliminates expensive maintenance and the concern about rotting or unsafe frames. You get maximum loading, maximum strength and maximum value with an arch steel building from Steel Building Garages. At Steel Arch Buildings, we take as much pride in our buildings as you do in your farm. That's why we offer this heavy-duty steel building that will keep protecting for generations to come. Please visit our Q Model Building Gallery for more images of our Q model.